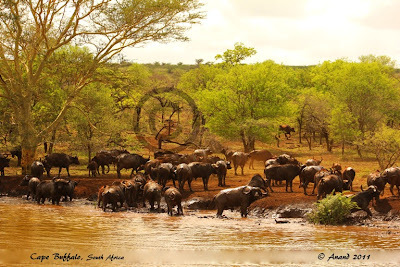 Ranging from ...: Monday Madness at a waterhole!! Monday Madness at a waterhole!! A waterhole in the African Wilderness on a warm afternoon can be a huge magnet for the game, attracting a wide variety of animals desperately searching for water. Keeping this in mind, one warm November afternoon we decided to do a short game drive focusing mainly on waterholes. 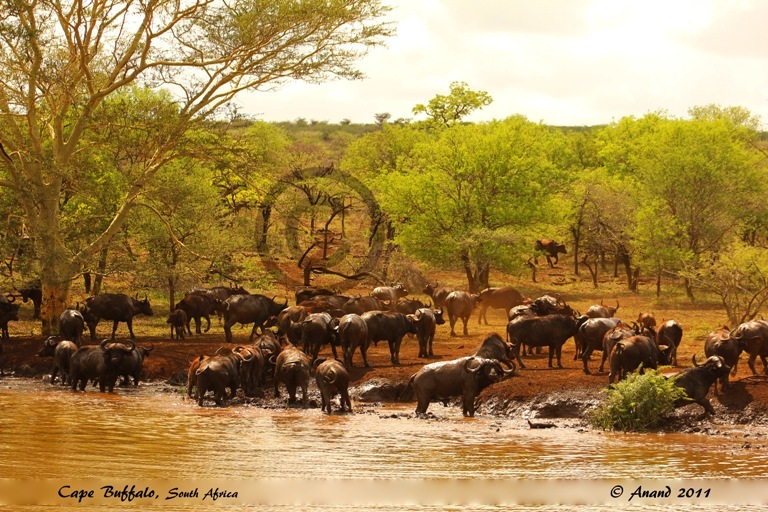 Our section in the reserve holds 10 waterholes with a regular supply of water. We started with the biggest of all surrounded by fever trees giving way to the open savannah. Except for the resident hippos there was no activity in the vicinity, at least the hippos were very active and kept us entertained. Now was the time to judge our patience. The wait began! Slowly as the temperature soared, animals like warthog, wildebeest and impalas started appearing in ones and twos. And within a few minutes something triggered the change and then appeared 5 white rhinos followed by buffaloes in small groups. What seemed like a quite waterhole now was the circle of animal mayhem. With the temperature rising so rose the tension. Big buffalo bulls and rhinos started pushing each other for the best wallowing spots. Disturbed by all of this, the hippos decided to prove their point and chased the buffaloes away for a while. It was surely a delight to watch and something that our young guests will not forget for years to come. At one time we had the following animals at the waterhole.